Refer Your Friends and Receive Huge Savings! Love the savings? Love the environmental benefits? Feel good about generating the energy your family uses right on your own home? Impressed with the quality installation and great price you are benefitting from? Share those feelings with your friends and family, and increase your savings! At Homegrown Energy Solutions we love what we do! We pride ourselves on quality installation and our upfront and educational sales process. Our goal is for you to love our service so much, that you share your experience with your friends and family. By helping us “get the word out”, you keep our costs low and that allows us to pass savings on to you in our Refer-A-Friend program, detailed below. 1. Review their property online so we are prepared to speak with them. 2. 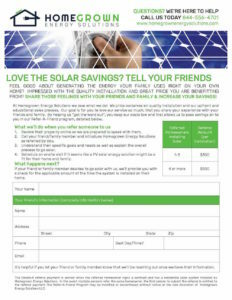 Call your friend/family member and introduce Homegrown Energy Solutions as referred by you. 3. Ask a few questions to understand their specific goals and needs as well as explain the overall process to go solar. 4. Schedule an onsite visit if it seems like a PV solar energy solution might be a fit for their home and family. Click on our Referral Program flyer to find out more.